This is a promotional article for Hana Tour. You win some, you lose some — that’s life! With Hana Tour, you’re going to win from start to finish. I was looking forward to the tour of the south side of Jeju Island with Hana Tour especially Dragon’s Head Coast. I was told that lunch was included and I knew of the areas we were to visit that day. With that, I boarded the tour bus, ate a light breakfast and closed my eyes for a little shut-eye. At the first stop on the guided tour, Hello Kitty Island, I sensed why many of my adult -women friends have a bit of an obsession with Hello Kitty. I stood there looking at a life-sized doll’s house and as much pink as anyone could stand to see at any one time. As we made our way to the third floor, the craze about Hello Kitty started to sink in, as everything bearing the Hello Kitty brand was absolutely adorable. And by the time the 3D movie on the 3rd floor was finished, a Hello Kitty fan had been born. Moving on, we arrived at Dragon’s Head Coast just as the sun was beginning to peek through the clouds. When I saw a huge ship on land, I knew some part of Jeju’s history was involved. The Hamel Ship is a museum covering Jeju’s maritime encounters with European countries, mainly the Dutch courtesy of the shipwrecked Hendrik Hamel. The group browsed the contents of the ship, then we made our way to some rocks to the east of it. After a 40-minute walk — you’re going to want to wear comfortable shoes — we were amazed at the nooks and crannies perfectly outlined on the rocks; it was like nothing I’d ever seen. The more we walked, the more amazing the natural carvings became. Jin, the tour guide, pointed out all the spots to take photos and even offered to take photos for me and several other tourists. Don’t be surprised if you find yourself on a mini photoshoot on this tour; I was later emailed quite a few photos that had been taken by fellow tourists. A stop for lunch was next up. As a vegetarian, I sometimes have a hard time finding restaurants that suit my diet. But Jin called ahead and made sure they would prepare something just for me. Everyone else seemed to enjoy their seafood meal as much as I was enjoying the vegetarian fried rice. We headed to Saeseom Bridge and for a walk along “Bird Island” that it connects to. On a cool day, this walk is perfect as you can see clearly across the water to Munseom islet, just a little further south. Here there is also the option to take a submarine tour that goes 20 meters below for a look at the corals. Although I didn’t go, the photos of fellow tourists suggest it was gorgeous. The last stop at Daepo Jusangjeolli Cliff was the perfect end to the day. The formation of the rocks will lead you to believe that sculptors carved them out. However, like Dragon’s Head Coast, these formations were made naturally. It’s quite beautiful to experience the wonderful things that come out of very violent volcanic eruptions. 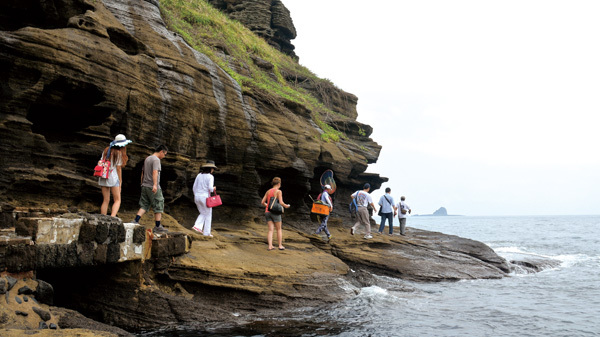 As for the Hana Tour guides, don’t be surprised if they point out where to stand to capture the best photos. One couple on the tour very much appreciated being treated like movie stars. I was very satisfied with the tour of southern Jeju and from the tired but content faces of the other tourists, I could tell they enjoyed it as well. 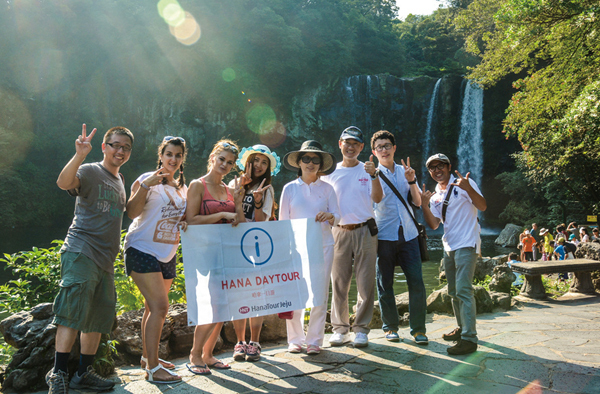 Jeju is a beautiful island and touring with Hana Tour you can expect an informed tour guide, incredible scenery, a satisfying lunch, and great photos to show for it — even if you happen to forget your camera at home.